Just stopping in to share something sweet from my Recipe Pile (yes, it really is a pile rather than a file these days!). I was searching for simple gifts for Christmas and this recipe looks perfect. 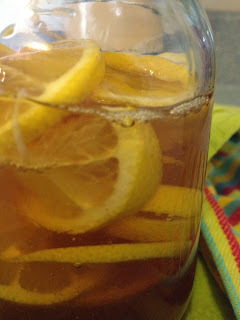 It will be lovely in half-pint jars decorated with dried lemon slices and a sprig of lavender. I may dress it up a bit for the holiday by using lavender infused sugar and infusing the honey with lemon balm or lemon verbena. But, even plain, this is sure to be tasty on biscuits or scones ... which reminds me, I have a recipe somewhere in that pile for Lemon Verbena Sweet Biscuits ... I'll share that one with you when I find it! Combine lemons, honey, sugar and water together in non-reactive pot. Bring to a boil, reduce temperature and let simmer for 30 minutes. Add pectin to the fruit and let it gently boil for 5 minutes. Remove from heat and fill jars. Apply lids and rings and process in a water bath for ten minutes. Let the marmalade sit overnight, to give the pectin time to fully activate.